Hey, look! It’s an animated GIF in which debut author-illustrator Zack Rock is showing us a spread being painted. I hope the animation is working for everyone. The new book is called Homer Henry Hudson’s Curio Museum and will be released in mid-August. “Everything has a story,” the book opens, and Zack’s is a beguiling one. 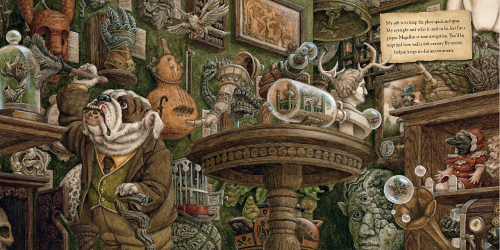 Henry is a bulldog, who owns a museum of curios from all over the world. He proudly displays several in the book and tells readers about them — from a Conatusaurus Skull from the Late Jurassic Period to a Humble Willow Root Cane. The collection includes delightfully bizarre artifacts, and Homer is a fine storyteller. 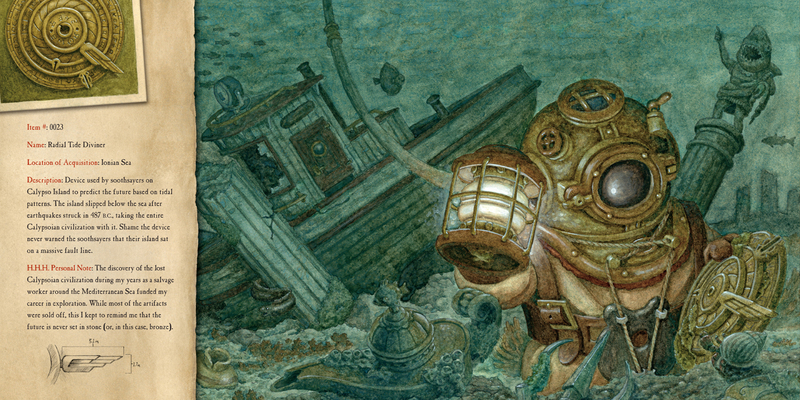 I like the art in this book (illustrations that the Kirkus review describes as possessing “touches of humble elegance”), and the writing is outstanding. (“My job is to keep the place spick-and-span,” Henry says when we first meet him. “My eyesight isn’t what it used to be, but I’m a proper Magellan at nose navigation. You’d be surprised how well a 6th-century Byzantine bedpan keeps its distinctive aroma.”) Zack Rock is one to watch. I’m going to let Zack talk now and share some of his artwork. Enjoy. p.s. If you visit his 2012 7-Imp post, you can spot Maurice Sendak, Shaun Tan, and Lisbeth Zwerger in one of the illustrations from this book. Zack: Thanks again for having me back aboard the good ship 7-Imp! It was an honor being previously featured as an up-and-coming illustrator and an absolute joy to return as an arrived-and-here illustrator. 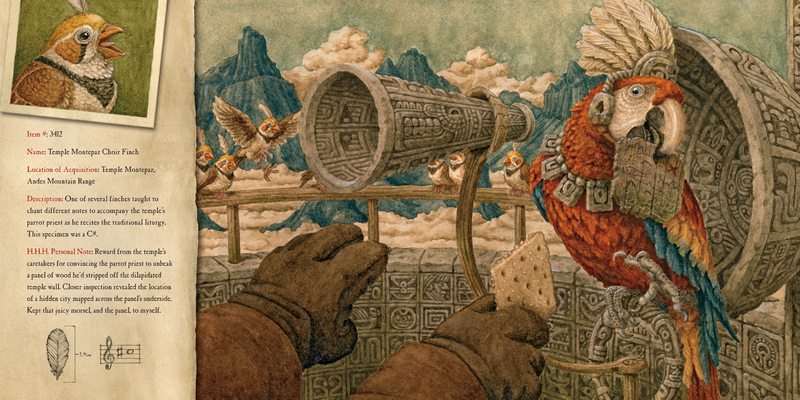 I can only hope 7-Imp will continue to record my career in the decades to come, even if it’s only in a Where Are They Now-type feature, far down the road (SPOILER: undefeated tango champion at Deer Glen Assisted Living Facility). 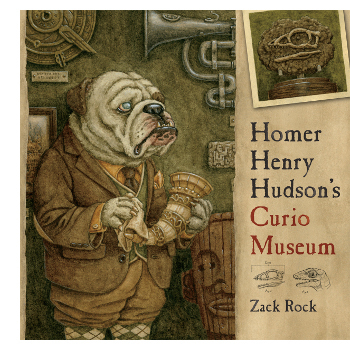 For now, I’m super excited to share my first book, Homer Henry Hudson’s Curio Museum! It’s the tale of a globetrotting explorer and the bounty of bizarre bits-and-bobs he collects on his adventures. Part Indiana Jones, part Hoarders, but with the one element those series were conspicuously lacking: an elderly, half-blind talking dog. 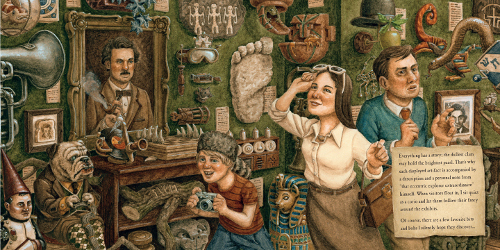 Starting in the present day with an introduction to the crowded museum, the book then flashes back to the rise and fall of Homer Henry Hudson via the curio descriptions themselves. It was a fun way to narrate his biography and buys the reader a ticket to all the exotic locales HHH has pilfered (as well as a sushi restaurant). 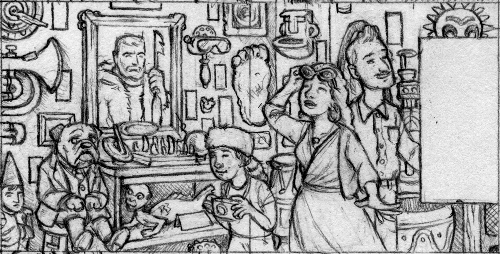 But the big draw for many has been the smörgåsbord of artifacts in the book. Every drop of my imagination was wrung out to fill the museum, leaving a scoosh over 100 exhibitions in the book. Each has a story, though for the most part I’ve left them for the reader to dream up. 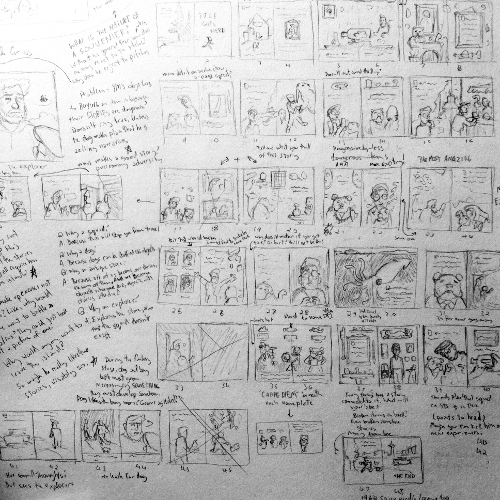 The journey from first draft to final was almost as calamitous as one of H³’s adventures. 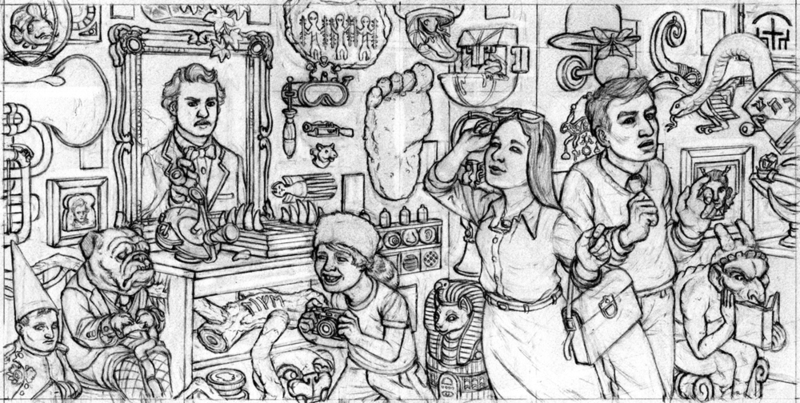 The original idea sprawled out to include seven main characters, a trio of taxidermic bulldogs, a pair of dead parents, and one sinister white squid. After some minor retooling (picture an axe-wielding lunatic with a vendetta against paper), I pared it down to only one main character. And only one dead parent. Working with Creative Editions on the book was beyond wonderful. 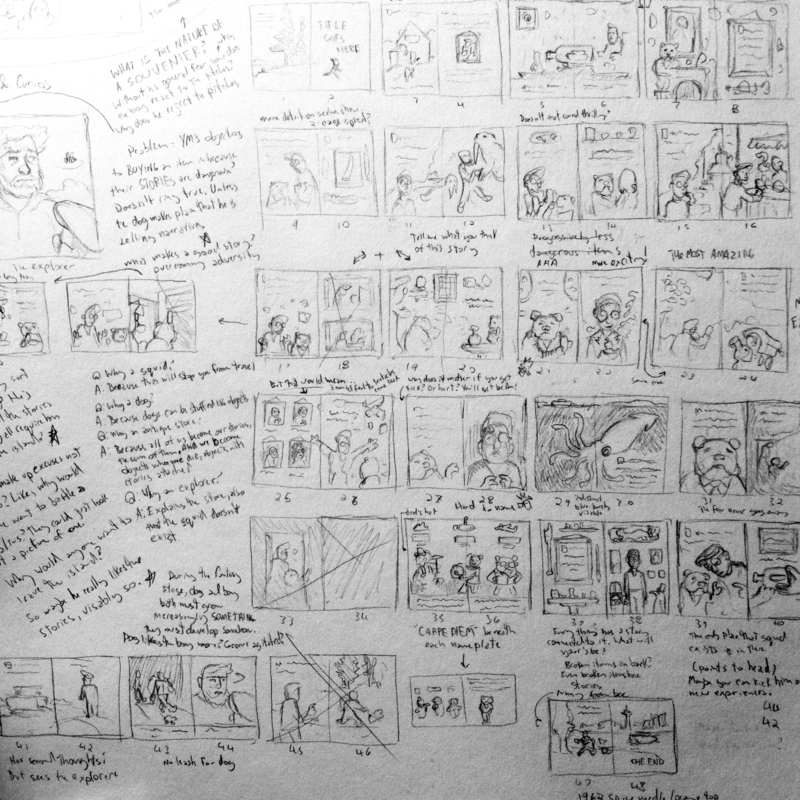 Tackling a project like this is daunting to say the least, but the dedication Creative’s publisher Tom and art director Rita had to Homer carried me through the many harrowing legs of the journey. When I first approached them with my portfolio, I felt like the high school Science Fiction Club president asking the prom queen for a dance, and I’m still stunned by the faith they have in my work. Zack: “My work space back in Seattle where I wrote and illustrated the book. Sadly, two individuals whose talents helped shape Homer Henry Hudson’s Curio Museum passed away before its release: my editor Aaron and printer, Ermanno. Along with writing some of the most engaging titles Creative Editions has released, Aaron’s deft red pen led my original text away from the brink of obscurity. 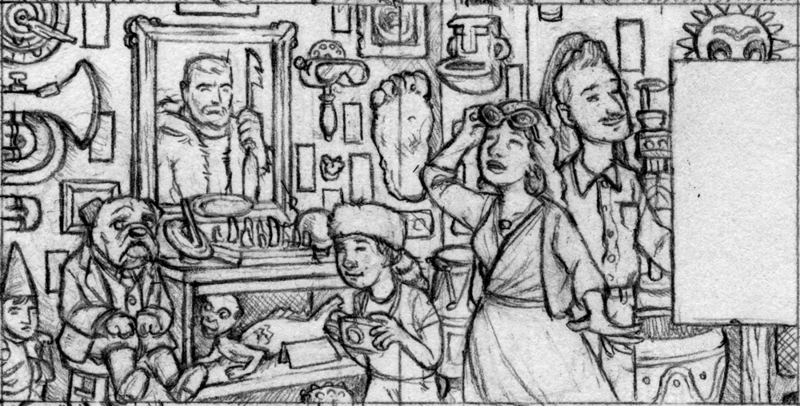 And Ermanno’s genius not only revived the illustrations after my particularly poor scanning job nearly derailed the project, he made them just shine on the page. But beyond their professional abilities, they were a couple of the warmest and kindest people I’ve ever met. The world’s poorer for their absence. 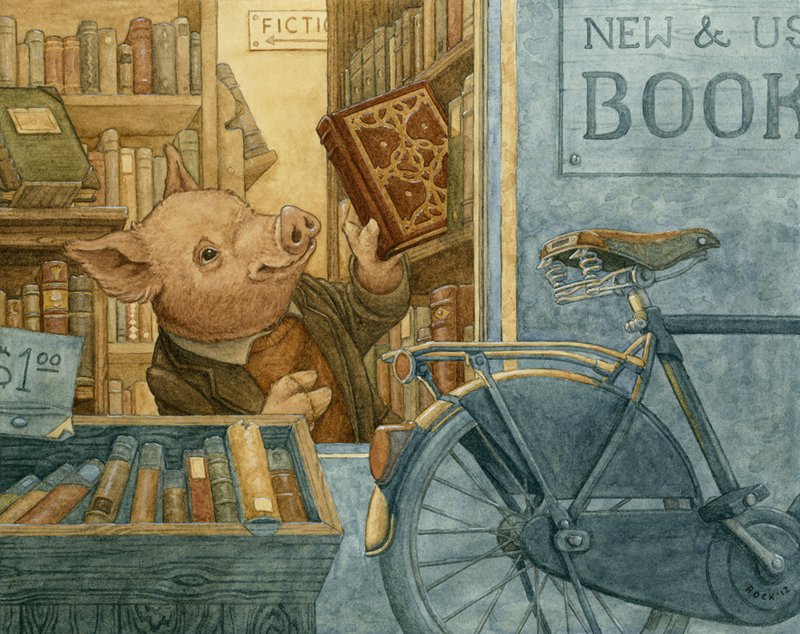 Currently, I’m chiseling away at another book for Creative [pictured above], this time about an acrobatic young pig whose life changes after an encounter with a bookstore. Something about surrounding short, squat little animals with stuff evidently appeals to me. It’s called The Unexpected, and you can expect it 2016. 1) It’s really neat to have Zack back at 7-Imp. 2) I GOT TO MEET JAMA, YOU ALL! And her very nice husband. And hang out with her in her beautiful home. I also got to see Sara Lewis Holmes, though it wasn’t my first time meeting her in person, and meet her husband. I’m lucky to have these people as friends in my life (and I could have spent all day talking to them). 3) This was all while we were in D.C. last week for vacation, which was a fun trip (“fun AND a lot like Social Studies,” said my 8-year-old). 4) There was this Wyeth exhibit at the National Gallery of Art. Hoo boy, I could have stayed ALL DAY in that one exhibit. 5) The book I wrote with Peter Sieruta and Betsy Bird came out on Tuesday of last week! (Should you wanna read it, by chance, here’s the low-down.) I had a book launch at Parnassus Books, which was fun. A local wine shop manager, Dan Hutchinson at The Wine Shoppe at Green Hills in Nashville, paired my book with some wines for the event, and he chose The Velvet Devil and Kung-Fu Girl (both from here). I mean, how wonderful is that? I have a video of the talk he gave at my launch, so I’ll try to share it soon. 6) People have been very supportive of and generous about the book launch, and I really appreciate it. I think I used the word “fun” an awful lot in this post, but it’s been a fun couple of weeks, in fact. So glad to see our regular Sunday space back up. How cool is this that Zack is back. I loved his goats two years ago and this book looks like a winner. Jules, hooray for you book baby! I will be getting one. Think it’s a must have for any school library. 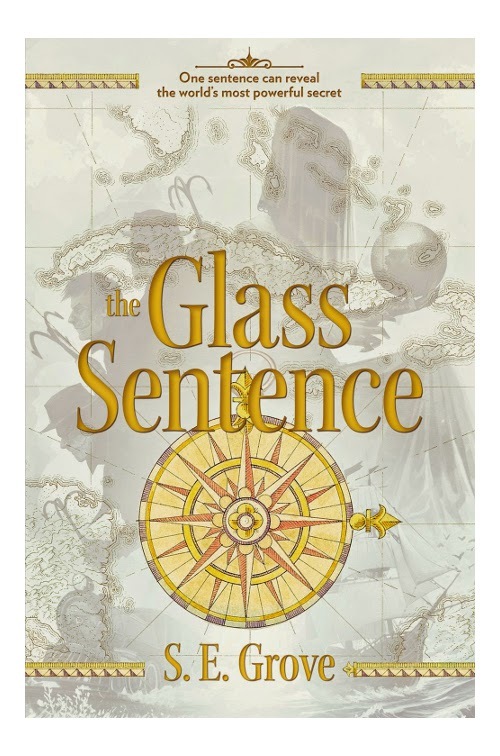 And The Glass Sentence looks curious. Oh, and you got to meet Jama and see Sarah! 1. Healing from shoulder surgery. 2. Watched The Book Thief last night. Makes me want to read the book again. 3. Time with family at the coast. 4. Time in Lake Tahoe with college pals. 5. Visiting Beach Books and listening to book suggestions from the owner. 7. Sunset on the beach. Good morning, Imps! Happy Sunday, one and all. Welcome back, Jules! Hope you are having a WILD (Things) month. 🙂 Glad that you and Jama (plus Jama-fama-ly and Sara) had fun hanging out. Welcome back, Zack! Thanks for sharing your art again. So awesome that you found such support from your publisher. I especially like the picture of the pig in the stacks. Adorable. Let us know when you have a release date so we can expect The Unexpected. Jone: Sending you healthy thoughts. I really like The Book Thief novel but haven’t seen the film yet. HI Jules! Congrats on the book launch! I will definitely be getting a copy. 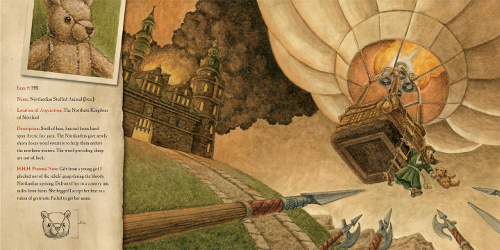 Love the story and illustrations – Zack has such a talent for creating a whole world in each illustration, I just want to keep finding all the little details. Jone – hooray for healing from surgery and time at the coast with family. 1) Annual Kickball tournament last weekend – great fun and we made the playoffs again. 2) Icebox cake for a friend’s birthday. 3) A much needed spa day. 4) A birthday lunch for a good friend – very fun. 5) Last minute invite to see Sara Bareilles – she was amazing – high energy and very emotionally honest performer. 6) My tomatoes are FINALLY ripening! I feel like they’ve just been hanging out green for weeks, so this is a relief. 7) Puppy sitting 2 cute shibas for a friend. 7.5) Saw Guardians of the Galaxy – great silly fun. I am very grateful for how amazing this summer has been. Hope everyone else has a wonderful week! Congrats again on the new book, Jules!! Your launch party looks like it was fun and well attended. Those wines sound perfect :). Glad your shoulder is healing well, Jone. Mmmmm, s’mores. Envy your garden tomatoes, Rachel. I’ll have a piece of icebox cake, thank you. 1. Meeting the entire Danielson family!! They are all adorable and purrrrfect. 2. Started reading Wild Things! on my Kindle. Too much fun. Can’t wait to receive my hard copy. 3. Another great throwback moment in Whole Foods: DC5’s “Because.” Had a huge crush on Mike Smith back in the day. 4. Meeting a good friend for dinner in D.C. Second time seeing her in person, first time meeting her lovely husband. 7. Three foxes (mother and two kits) coming to dine on scraps outside the kitchen door. White tips on their tails, and long black stockings. Jone, good to hear you’re healing! Glad you got to visit the coast, and I’ve been wondering if the film adaptation of The Book Thief is good. I’ll have to check it out. Little Willow, “selections” reminds me that you are typically very modest about all the good things happening in your career. I can only assume “selections” means an altogether NEW instance of someone selecting something you’ve written for the stage? If so, congrats! Rachel, it makes me happy to read your summer has been “amazing.” I’m curious about Guardians of the Galaxy. I keep hearing it’s a hoot and very fun, and yet I’ve yet to see a preview. I’m a pop culture moron sometimes. Jama: I love how you described the foxes. Rachel: Sara Bareilles is AMAZING. So glad you got the chance to see her live – as you said, she’s a very honest and awesome performer. I hadn’t heard of icebox cake before! I hope you are having fun with the Shiba dogs – they have wonderful smiles, don’t they? Jules: You are correct! 🙂 Thank you! Must check out Sara Bareilles. And congratulations, LW, on all the good things happening in your career. Well.Jules, good choice to feature such a real talent. We met a year ago in Bologna, he was such a young mad dog! riding a bike around the Book Fair. I am also happy he names the departed Aaron Frish-the editor he had at Creative, and Ermanno Beverari, our superb printer in Verona. thinking about it, Zack’s work reminds me of Rick Schreiter (The Plums of king Oscar the Bad, for instance, published by Harlin Quist in 1967 I believe. He was an immense talent too, but life was hard on him (and Quist stole everything he could!) Rick disappeared. Years later he was a homeless, a friend told me. I looked everywhere to find him, to work for the famous series of Fairy Tales issued in 183-4 by Creative. Rita Marshall art directed the 20 books, and was helping in the search. I miss very much Schreiter, 40 years later! Jules, I was happy with the adaptation of The Book Thief. THAT is a splendid GIF, btw. What a lovely, detail-oriented artistic style. LOVE.